If you love Nokia hardware but wish for a better operating system, consider what some enthusiastic developers have done.As part of a project called NITDroid, the developers have created a compatible version of the Android operating system for Nokia’s internet tablets. The result is a device that has the body of Nokia and the brains of Android. Eden’s Nokia-Android hybrid works well except for access to Google Market and apps, he says. Meanwhile developers have created a stable version of Android 2.2 Froyo for the Nokia N900, which ships with Nokia’s Maemo operating system. They have been able to get calls, data and Google apps going on the hacked device. The only missing feature is camera support. This is not the first time a phone has been hacked to run an entirely different kind of operating system. Eager to experience Android’s features, some intrepid smartphone users hacked their Windows Mobile phones to run Android. 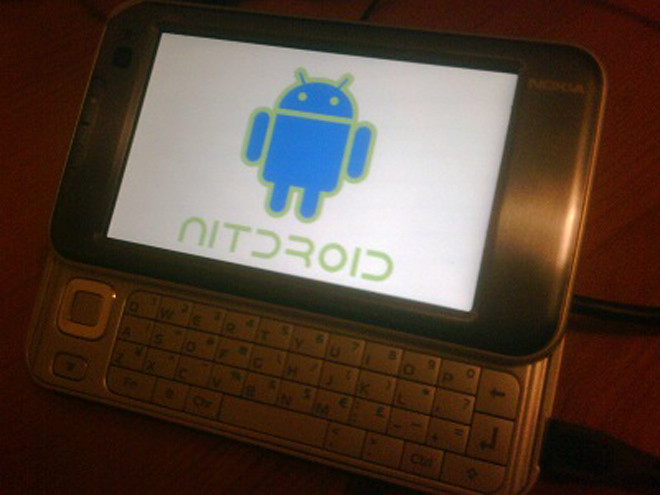 With Android for Nokia phones, the NITdroid project has had varying degrees of success. So far, they have attempted to port Android for Nokia’s tablet range of devices — which means the Nokia N770, N800, N810 and N900. “On the N810, everything is pretty much functional. It isn’t a phone so there’s no call functionality to deal with,” says Eden. Tweaking the Nokia phones to change its operating system to Android isn’t for everyone, says Eden. Now You have to install two more updates to Patch some Bugs in the OS. Make sure you install the updates correctly. After the updates are installed you are done Installing Android Gingerbread On your Nokia n900 . just slide open your keyboard and reboot your phone. you will get a Dual Boot Option screen Select Nitdroid And Unleash the Gingerbread Power. The Qt SDK is the easy-to-install and use development environment for creating outstanding Qt apps for Symbian phones and the Nokia N9. In this tutorial you'll find out how to download, install, and use the Qt SDK 1.2.1 to create and deploy your apps. To download the latest Qt SDK, go to the Qt SDK download page. It contains more details about the SDK including the system requirements. Each installer is available in both offline and online versions. The offline version includes the entire Qt SDK, while the online version downloads the software during the installation process. If you encounter problems with the online installer on a corporate network, use the offline installer instead. Figure 1: The SDK's details page provides offline and online installers for Windows, Linux, and Mac OS X. Once you have downloaded your choice of installer run it in the usual way to install it on your computer. Figure 2: The setup wizard opens; this may take a while on slower PCs. Figure 3: Select the installation directory. Figure 4: Accept the license agreement. Figure 5: Select a Start Menu location in which to place the SDK's shortcuts. Figure 6: The download and installation progress of each component can be monitored. Once the installation is complete, the setup wizard will prompt you to launch Qt Creator and the Qt SDK. The SDK includes Symbian and Nokia N9 development tutorials that describe how to configure the debugging and deployment environment for each target. You won't need them at this point; you can find them later in the <QtSDK_install_path>\readme directory. Figure 7: Once installation is complete, click Finish to launch the Qt Creator IDE. Figure 8: Qt Creator having been successfully launched. At this point, no further configuration is needed, because the Qt SDK contains everything you need. Symbian OS phonez. It has been personally tested by me on d Followin fonez: C5, E5,E71,E63,C6,E72,E75. It took me 3minutes 2 Hack C5. [ICON PACK] Windows Phone Tiles. Now In 3 Different colours. [GUIDE] How to unroot android devices by siidheesh. [ 3.026] WRN:L149(OSAL/OSAL_De.c):Length is ZERO! [ 0.053666] try to parse apb frequency from script faild! 1) Hashing :- Here we will refer to the one way function (which may be either an encryption function or cryptographic hash) employed as a hash and its output as a hashed password. If a system uses a reversible function to obscure stored passwords, exploiting that weakness can recover even 'well-chosen' passwords. One example is the LM hash that Microsoft Windows uses by default to store user passwords that are less than 15 characters in length. LM hash breaks the password into two 7-character fields which are then hashed separately, allowing each half to be attacked separately. Hash functions like SHA-512, SHA-1, and MD5 are considered impossible to invert when used correctly. In one survery of MySpace passwords which had been phished, 3.8 percent of passwords were a single word found in a dictionary, and another 12 percent were a word plus a final digit; two-thirds of the time that digit was. A password containing both uppercase & lowercase characters, numbers and special characters too; is a strong password and can never be guessed. 3) Default Passwords :- A moderately high number of local and online applications have inbuilt default passwords that have been configured by programmers during development stages of software. There are lots of applications running on the internet on which default passwords are enabled. So, it is quite easy for an attacker to enter default password and gain access to sensitive information. A list containing default passwords of some of the most popular applications is available on the internet. Always disable or change the applications' (both online and offline) default username-password pairs. 4) Brute Force :- If all other techniques failed, then attackers uses brute force password cracking technique. Here an automatic tool is used which tries all possible combinations of available keys on the keyboard. As soon as correct password is reached it displays on the screen.This techniques takes extremely long time to complete, but password will surely cracked. Long is the password, large is the time taken to brute force it. 5) Phishing :- This is the most effective and easily executable password cracking technique which is generally used to crack the passwords of e-mail accounts, and all those accounts where secret information or sensitive personal information is stored by user such as social networking websites, matrimonial websites, etc. Phishing is a technique in which the attacker creates the fake login screen and send it to the victim, hoping that the victim gets fooled into entering the account username and password. As soon as victim click on "enter" or "login" login button this information reaches to the attacker using scripts or online form processors while the user(victim) is redirected to home page of e-mail service provider. Never give reply to the messages which are demanding for your username-password, urging to be e-mail service provider. It is possible to try to obtain the passwords through other different methods, such as social engineering, wiretapping, keystroke logging, login spoofing, dumpster diving, phishing, shoulder surfing, timing attack, acoustic cryptanalysis, using a Trojan Horse or virus, identity management system attacks (such as abuse of Self-service password reset) and compromising host security. However, cracking usually designates a guessing attack. If you like this eBook, please submit this post to your favorite social-media sites and spread the news. “Another collection of hacks? Yes! 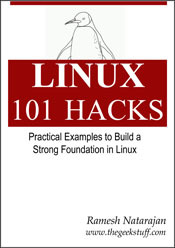 If you have just completed your first admin course or looking for better ways to get the job done the “Linux 101 Hacks” eBook is a good point to start. These useful tips are concise, well written and easy to read. Password: To get the password, follow these 3 easy steps. Would you like to know how your hard disks behave? Or how well does your CPU churn? iostat is a utility that reports statistics for CPU and I/O devices on your system. It can help you identify bottlenecks and mis-tuned kernel parameters, allowing you to boost the performance of your machine. vmstat does the similar job, except it works with the virtual memory statistics. For Windows users, please note the term virtual does not refer to the pagefile, i.e. swap. It refers to the logical abstraction of memory in kernel, which is then translated into physical addresses. Here's something radical: create a small UDP server that listens on a port. Then configure a client to send information to the server. All this without root access! netcat is an incredibly powerful utility that can do just about anything with TCP or UDP connections. It can open connections, listen on ports, scan ports, and much more, all this with both IPv4 and IPv6. In our example, we will use it to create a small UDP server on one of the non-service ports. This means we won't need root access to get it going. The most interesting bit is the line that starts with exec. The limitation with the exercise above is that we do not control over some of the finer aspects of our connection. Furthermore, the connection is limited to a single end-point. If one client connects, others will be refused. To make things more exciting, we can improve our server. Instead of using netcat, we will write one of our own - in Perl. Perl is a powerful programming language, very flexible, very neat. I must admin I have only recently began dabbling in it, so do not expect any miracles, but here's one way of creating a UDP server in Perl - there are tons of other implementations available, better, smarter, faster, and more elegant. The code begins with the standard Perl declaration. If you want extra debugging, you can add the -w flag. If you want to use strict code, then you may also want to add use strict; declaration. I warmly recommend this. This one tells Perl to use the IO::Socket object interface. You can also use IO:Socket::INET specifically for domain sockets. For more information, please check the official Perl documentation. We are trying to open the local UDP port 50060. If this cannot be done, the script will die with a rather descriptive message. Next, we define a variable that will take incoming data (datagram) and the buffer size. The buffer size might be limited by the network implementation or network restrictions on your router/switch or the kernel itself, so some values might not work for you. And then, we have the server doing some hard work. It prints the data to the screen. But it also creates a log file with a time stamp and prints the data to the file as well. The beauty of this implementation is that the server permits multiple incoming connections. Of course, you will have to decide how you want to differentiate the data sent by different clients, whether by a message header or using additional IO:Socket:INET objects like PeerAddr. We have top running in batch mode (-b). It's going to refresh every 10 seconds, as specified by the delay (-d) flag, for a total count of 3 iterations (-n). In general, with static data, this is not a problem. You simply repeat the write operation. With dynamic data, again, this is not that much of a problem. You capture the output into a temporary variable and then write it to a number of files. But there's an easier and faster way of doing it, without redirection and repetitive write operations. The answer: tee. tee is a very useful utility that duplicates pipe content. Now, what makes tee really useful is that it can append data to existing files, making it ideal for writing periodic log information to multiple files at once. Once this is done, every single process will be logged. You can find the logs under /var/account. The log itself is in binary form, so you will have to use a dumping utility to convert it to human-readable form. To this end, you use the dump-acct utility. Like pacct, you can also dump the contents of the utmp and wtmp files. Both these files provide login records for the host. This information may be critical, especially if applications rely on the proper output of these files to function. How to add internal links within blog posts in blogger? Hey friendzzzz!!!! It's a time to learn about something new in our blog ie. about blogging tips and tricks.JOIN US ON FACEBOOK Guys we all know many of the time comes when you want to redirect your readers to a different part of your blog posts within the blog depending upon their needs and intrests and some important terms based.